Users having SIM cards or Wi-Fi accounts from participating telecom companies/ISPs can enjoy "free and secure Wi-Fi" in the cities. No on-site registration is required. There is no login page blocking the web browsing. NGHSIG is participating in the City Wi-Fi Roaming trial, which is being held from June 20, 2017 (World Wi-Fi Day) to Aug. 20. The easiest way to experience the Hotspot 2.0/Passpoint/NGH is probably to register your device here and install the profile. Many access points in Japan carry eduroam SSID as well as the Hotspot 2.0 one. Your phone/computer should be connected automatically to the network. In this case, the connection is not via Hotspot 2.0.
anyroam is also available on the eduroam SSID. So far, the access points outside Japan accept the eduroam accounts from a limited number of institutions only. The eduroam users in Japan may be able to get on the network by picking up the SSID manually. If you want to try, please contact NGHSIG (nghsig at rd.cc.tohoku.ac.jp) to obtain the test accounts valid in this trial. If you have a relatively new phone with a SIM card from one of the telecom companies participating in the trial, your phone would have a chance to be automatically connected to the network. If the Hotspot 2.0 feature doesn't work on your phone, you may try picking up the SSID manually and setting EAP-AKA (or EAP-SIM) for authentication method. The hotspots in Japan can be found in the map above. It may not be so easy for tourists to find the hotspots for this trial as many cities have not provided hotspot lists or maps. Some known sites are shown below. 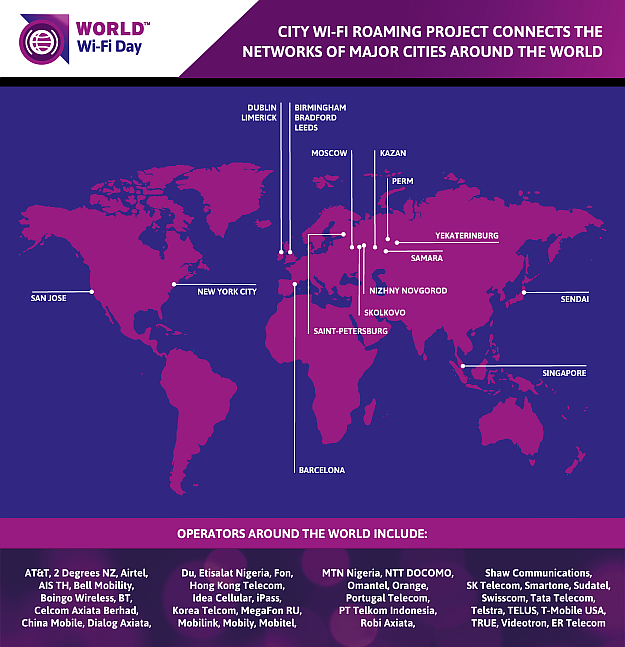 (As of Aug. 14, the World Wi-Fi Day's Passpoint profiles do not seem available in Birmingham and Leeds (and Bradford?). See "City Centre WiFi" in this article.